Teachers, review the following information with your students and then use the board work included below with your students to ensure that students understand the concept of contractions. When you are speaking to your friends do you say things like "can't", "aren't" and "wouldn't"? These words are called contractions and are actually made up of two words put together. Listen to the following sentences, then answer the question "Which sentence would you use?" Choose the sentence that you would be most likely to use if you were talking to your friends. I can't play video games today./ I cannot play video games today. She's wearing a pretty ribbon./ She is wearing a pretty ribbon. When it's time to go we'll pick up our toys./ When it is time to go we will pick up our toys. You probably use contractions every day without even knowing it. Contractions make speech flow smoother and make writing faster because you don't have to write so many letters! This may be good news for people who don't like to write! Write the following paragraph on the board. Have students change contractions for the two words that make up the contractions. Have students replace two words with contractions. The correct answers are provided in capital letters. Review the corrected paragraph with your students. I went to the park yesterday, but I didn't _______ _______ (DID NOT) play on the swings. Because it did not __________ (DIDN'T) rain, we got to stay there all day! I can not ____________ (CAN'T) believe we were there all day and I wasn't _________ ___________ (WAS NOT) on the swings one time! Normally I would play on the swings until it is ______ (IT'S) time to go! The next time we go to the park I'll ___ _______ (I WILL) play on the swings until we have __________ (WE'VE) got to go home! Once the paragraph exercise is complete, ask students to come up with contractions on their own. 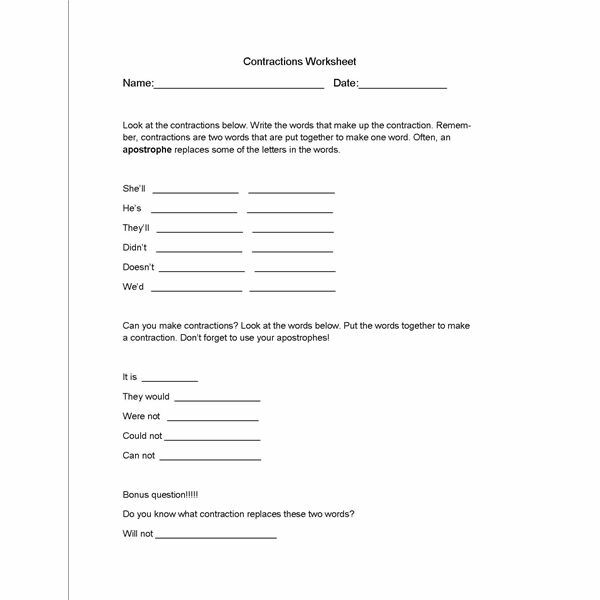 After hearing several contractions, hand out the printed Contractions Worksheet included with this lesson plan. Ask students to complete the worksheet either in class or as homework.